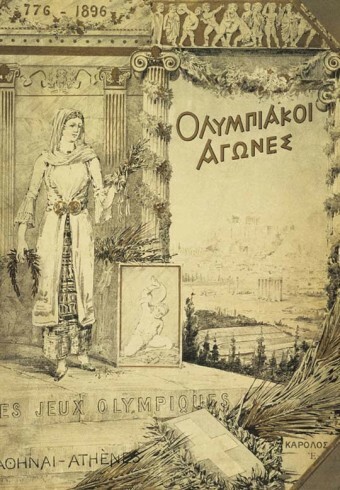 On April 6, 1896, King George I of Greece proclaimed the opening of the first international Olympic Games held since Roman Emperor Theodosius I banned them about 1,500 years earlier. A crowd of 60,000 gathered in Athens to welcome athletes from 13 nations gathering to compete in 43 events, including swimming, wrestling, track-and-field, gymnastics and cycling. All of the contestants were men, and some were athletic-looking tourists who chose to enter and were allowed to participate. The first known Olympic Games took place in 776 B.C.E. at Olympia in the Greek city-state of Elis. The Games, which were held every four years during a festival honoring Zeus, are thought to have been held for more than five centuries by that time. The competition was pretty basic at first – just limited to foot races – but over the years wrestling, boxing and chariot racing were added. In 708 B.C.E. the pentathlon was included, consisting of the long jump, discus and javelin throw, wrestling and foot races. But with the spread of the Roman Empire, the Olympic Games fell into decline. They were abolished completely in 393 C.E. when the Christian Roman Emperor Theodosius I outlawed the Games as part of his “Wipe Out the Pagans” campaign. During the Renaissance, everything from the Classical period became fashionable, and Europe began a long obsession with all things from ancient Greece. There were small festivals and informal sporting events dubbed the “Olympic Games”, but it wasn’t until the 19th century that any serious proposal to resurrect the ancient contest was attempted. While Evangelos Zappas, inspired by Panagiotis Soutsos’s 1833 poem Dialogue of the Dead which lamented the loss of the greatness of Greece including the loss of the Olympic games, got approval for, and funded out of his own pocket, local Olympic games in Greece starting in 1859, it was a young French nobleman named Pierre de Coubertin who was key to the international games as we know them today being developed, along with many of the iconic things associated with the games, like the Olympic Rings. He raised the idea in June of 1894 at a conference on international sport, and delegates from 79 nations ultimately accepted his proposal. The International Olympic Committee was formed, with de Coubertin as president, and it was agreed that the first international Games of the modern era were to take place in Athens, Greece, in 1896. The event only lasted ten days, the rowing and sailing events had to be cancelled due to weather, and there were no real eligibility requirements, other than an individual seeming fit to compete in a given event. So it was hardly the slick show-bizzy sporting event it has become. All in all, de Coubertin was pleased with the results. He emphasized the importance of changing the location of the Games every four years to make it a truly international event, which was a disappointment to Athens, as the city was hoping to be the permanent venue for the Olympics. In the 1500s, most Roman Catholic countries & Scotland adopted the Gregorian Calendar (established by Pope Gregory XIII to compensate for the errors in time that had built up over centuries) over the Julian Calendar (introduced by Julius Caesar in 45 BC) . A lot of protestant countries, however, ignored this new calendar for another 200 or so years. England stuck to the Julian Calendar until 1751 before finally making the switch. Orthodox countries took even longer to accept the change in calendars. Russia, for one did not convert to the Gregorian calendar until after the Russian Revolution in 1917. What does this have to do with the Olympics? In 1908, the Russian Olympic team arrived 12 days late to the London Olympics because of this. At the 1904 Summer Olympics, American gymnast George Eyser fared quite well- he won six medals: 3 gold in long horse vault, 25 ft. rope climb, and parallel bars; two silver in the 4-event all-around and pommel horse, and one bronze medal in the horizontal bar. While winning six medals in the Olympics is quite an accomplishment for anyone, what makes Eyser even more unique is that he competed with a wooden leg. During his youth, Eyser lost most of his left leg after a train ran over it. This, however, didn’t stop him from making history a few years later, becoming the only person to compete in the Olympic Games with an artificial leg, until 2008 when South African swimmer, Natalie du Toit, competed in the Beijing Olympics. The 1904 Olympics included mud fighting. If that seems odd, you should also know that greased pole climbing was also in the 1904 Olympics. Tug of war was an Olympic event until after the 1920 Olympics. Multiple teams from countries were allowed, which is how the U.S. won bronze, silver, and gold in tug of war in 1904. Britain did the same thing in 1908. Not only have hundreds, if not thousands, of errors (spelling, grammar, facts-replaced-by-fiction, anti-religious bigotry, etc.) been reported to the “owner(s)” by readers — including dozens by me — but that person (or those people) seem(s) to want to continue to make published errors and to offend readers. He/they refuse(s) to get a professional editor’s assistance. I say this because, although TIFO has had my e-mail address for at least a couple of years, it has never contacted me to ask for help. It has just been so sad for me to think (day after day after day) about how much better this site could be. J.F. Gecik: “refuse(s)” in reality is there’s no money for it. With the continued rise of ad-block, there’s increasingly even less money just for the core content itself, despite traffic continually going up. Professional proof-readers aren’t cheap (and even the very expensive ones miss things frequently from my experience). And while people have volunteered to help on that front in the past, without fail they have all left fairly quickly when they realized how much work it is to typo check these articles on a daily basis. If this were a grammar blog, of course it would be critical to get multiple professional proof-readers in to minimize typos. (There would still be some, even then, however.) But it’s an information blog, so we spend most of our effort on research and trying to make things like historical or science topics as interesting as possible, without sacrificing accuracy. In a perfect world, we’d do both. For instance if these articles weren’t so research intensive (like if this were a celebrity gossip style site *shudder*), they’d be drastically cheaper to produce and then the money would be there for some people solely spending their time on looking for typos, rather than perfecting the core content. But, in the end, I think most would prefer we keep as much money as possible for interesting (and accurate) content generation. For instance, many thousands of people have read the misspelling in the title on this article, and yet you’re the first (after almost a year) to comment on it, which, to be clear, I very much appreciate. 🙂 Commenters willing to politely point out typos is probably the best and most practical free way to get rid of them from my experience. “It has just been so sad for me to think (day after day after day) about how much better this site could be.” Me too, but less to do with typos and more to do with all the things I could do with this site if I had a much bigger budget. So many great ideas that there is never time or money to implement, that I think people would absolutely love and in some cases would be very valuable to educators to get kids interested in certain topics. 🙂 Unfortunately right now I have to spend most all my scant free time outside of content generation in simply figuring out how to keep this free site going despite the rapid rise of ad-block. And any ideas that do get implemented have to be ones that make money, rather than just picking the ones that would be really awesome.